I guess you could say; I was born with the entrepreneurial bug. Since the age of six — I’ve been exploring different ways to make money. I've gone door-to-door selling arts and crafts to neighbors, hosted lemonade stands, collected salamanders and sold them to the local pet shop, as well as participated in many garage and yard sales. As I got older this trend continued, I provided babysitting services to friends and family; I sold stuff to consignment stores, I even participated in pharmaceutical research studies. If there was a way to make money — I found it. To this day, I still get excited when I find a new way to make money. 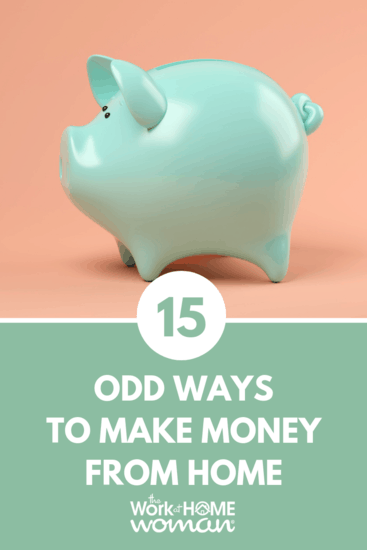 So if you're looking to make some extra cash, here are 15 odd ways you can make money from home. 1. Do you like to test things out? Become a product tester and reviewer, and you can earn free products, services, gift cards, and sometimes even cash for sharing your opinions. The Product Review Mom has more sites that offer free products for review and payment. 2. Do you have the latest and greatest in tech gadgets? Then sell your old smartphones, tablets, laptops, and computers on Gazelle. Simply find your gadget on their website, answer some questions, ship it off for free and get paid via check, Amazon gift card, or PayPal. Gazelle has an A+ rating with the Better Business Bureau. 3. Do you love taking photos with your smartphone? 4. Are you a know it all? Here are some other platforms where you can sell your expertise for moola. 5. Is your car just sitting around? Do you have a class A, B, or C motorhome? What about a pop-up, travel trailer, or fifth wheel? Then put your recreational vehicle to work when you're not using it. RVshare is an on-demand platform that connects RV owners with renters. It's completely free to use, and according to their website, you can earn $120 – $365 a day! Booked rentals include 24/7 roadside assistance (so you know your RV is in good hands) and RV rental insurance. RVshare has been featured on CNN, the New York Times, NBC, Huffington Post, along with numerous other publications. Now that your driveway is empty consider renting it out too. Parklee is a match-making service for property owners and drivers. Here’s the premise, we all know that at certain times of the year parking can be a nightmare. Parklee connects drivers with household owners who have extra parking space to spare. Just create an account, Parklee will do the matchmaking, and you’ll earn some extra money for allowing individuals to park at your house. 6. Do you like to share stories, tips, recipes or jokes? Magazines are continually looking for new content that’s why many publications are willing to pay for short stories, recipes, reader tips, poems, and even jokes. Here are just a few publications that pay for submissions. As a side note, I haven’t submitted tips to any of these sources, so I’m unable to comment on the validity of them. The Thrifty Couple has more tips for submitting tips and photos to magazines. 7. Do you love surfing the web? Then make money testing out websites, apps, videos, ads, ideas and more on Userlytics. Sign up for a free account and then wait for an invitation to give feedback. User tests take about 10 – 20 minutes to complete, and payment is $10 or more per test made via PayPal. Userlytics is open both to US and International residents. 8. Do you enjoy walking around town? GigWalk is a mobile workforce of individuals using their smartphones to connect, explore, and earn a second paycheck as they go about their day. Just register, apply for an assignment and then complete the task (usually verifying roads and street signs, geographic landmarks, transportation options or store inventory with your smartphone’s camera). According to their testimonial page, one gig Walker made $1,200 in a week; more realistically it looks like the average assignment pays between $3.00 – $50.00. Jobs are available in the main cities across the United States. Membership is free. 9. Do you LOVE sharing great deals on social media? You're already sharing your favorite products and services on social media, why not get paid for it?! Here’s how Share Magnet works. Companies create “magnets” for their goods and services on Share Magnet. Individuals create an account and browse the available magnets and share which ones that interest them. Each magnet has a specific monetary value assigned to it, ranging from .02 cents to $2.00 per share. Once you find something you like, you share it on one of the various social media channels, like Facebook, Twitter or LinkedIn. So what kind of businesses are advertising on Share Magnet? I found sites like Sitter City, Hudson Jeans, Zulily, and Working Mother Magazine. While you’re not going to get rich sharing magnets, it is a fun way to earn some extra pocket cash from home, and it’s free to join! 10. Do you like doing internet research? Wonder is a new online marketplace where individuals can ask questions and where you can get paid for doing internet research. Researchers set their schedules, choose which requests to work on, and which price points to accept. Top researchers can earn as much as $35+ per hour, and earn up to $2K per month. Researchers are paid every other week, via PayPal. 11. Do you love shooting video? Now you can get paid for your newsworthy video clips on Newsflare. Create an account for free, shoot your video, and upload it to the Newsflare website. If they sell your clip to a media outlet — you earn money. According to Newsflare, “Some of our members have made thousands, many have made hundreds. We negotiate individual license fees for every single video that take into account how a buyer wants to use your video and where it will be published or broadcast. We work very hard to try and make as much money as we can from every single video uploaded to Newsflare – because it's in everyone's best interests that we do!” Payments are made via PayPal usually within 24 hours of the sale. Newsflare is based in the UK but is available to global residents who can accept PayPal. 12. Want to make money being creative? On beeoux (formerly Zazzy), you design jewelry (or choose from their ready-made templates), import the designs to your store (Etsy, Shopify, Amazon, or Woo Commerce) and then start earning money! beeoux ships the products directly and they only take a fee when you make a sale. To start selling, you must currently request an invite. Voxpopme is a new take on paid surveys and smartphone apps. Available for both iPhone and Android users, Voxpopme allows users to browse a feed of questions that are personally targeted to each user. Just pick a query, use the record button on your smartphone and leave your 15 – 60-second response. Build up your earnings by answering multiple questions. You can also earn $1 for each friend that you refer Voxpopme, who submits an approved video response. Payments are made via PayPal. Voxpopme is available to US, UK, Singapore, and Australian residents and has a 4 out of 5-star rating in the app store. 14. Are you great at finding deals? Dealspotor is an online community where individuals can share deals and coupons. By sharing deals, interacting with brands and other members you can earn karma points which can be traded in for Amazon gift cards. You can earn additional karma points for referring friends to the platform. It takes 10,000 karma points to earn a $10 Amazon gift card. I’m still playing around with this platform myself, so I’m unable to say how quickly you can earn points. If you choose to try it out, you can use my referral code: HOLLYHANNA, and you’ll receive 5,000 extra karma points. 15. Are you a talented artist or designer? PosterMyWall is a platform that allows creatives to make money from home. Here’s the gist of how it works. You sign up for a free account and using their design tool, create posters for things like bake sales, auto shows, bands, graduation, restaurant promotions, parties, and more. Each time one of your designs sells you earn up to a 60% royalty on each sale. Payouts are every three weeks via PayPal. One of the top designers on the website, Renee Robinson, has sold over a million images — pretty impressive! As you can see, there are lots of quirky and odd ways to make from home. The key is to start thinking outside the traditional employment box. As they say, if there is a will there is a way. What interesting and weird ways have you earned money from home? Drop us a note; we'd love to hear from you! If you enjoyed this post — please share it on your favorite social media site. 28-Day Case Study: Can You Make Money Entering Giveaways? Originally published April 2, 2014. Content updated on December 18, 2018. I’ve never heard of #8, I’ll have to check it out! Glad you found something new, Miranda! Thanks for stopping by! Aww, thanks for your kind words, Nea! What part of Portugal? I’ve traveled to Lisbon before – beautiful place! Each magazine will have different protocols for submitting recipes, so you’ll need to read what their submission guidelines are. I do not have a website yet? Would like to know if there is one you prefer that does not cost an arm and leg? Yep, transcribing is a great way to make money from home. You can also look at sites like QuickTate and VerbalInk — they hire general transcribers. I have written about ebates — love them! It’s a must if you shop online. Great stuff here. There are also sites where you can fill out surveys or test websites. And I guess if you have something interesting to say you could always blog.